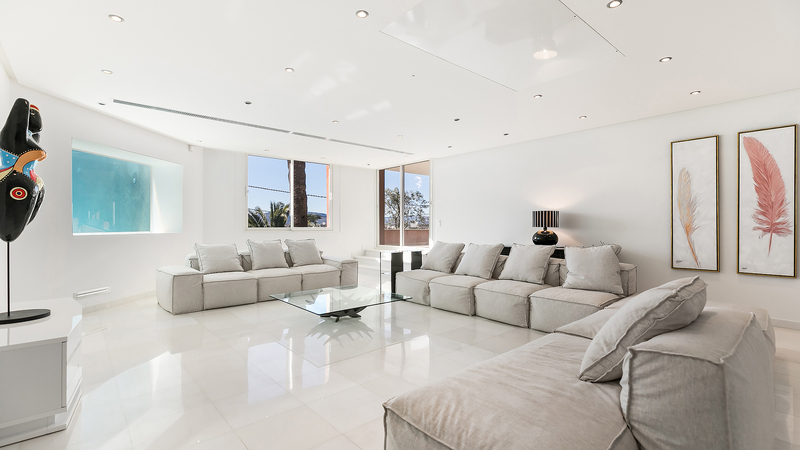 CAR1366 is set in one of the most sought-after neighbourhoods in Cannes. This exceptional property boasts 8 bedrooms and is the ideal base for a holiday on the French Riviera. The property is stylishly decorated with contemporary décor, the villa has 6 double ensuite bedrooms plus a 2-bedroom private apartment which can be used as staff accommodation. The villa is fully equipped with an elevator, air conditioning, WIFI and a high-tech alarm system and comes with a magnificent heated infinity pool and offers panoramic views over the bay of Cannes and the stunning mountains of the Massif de l’Esterel. 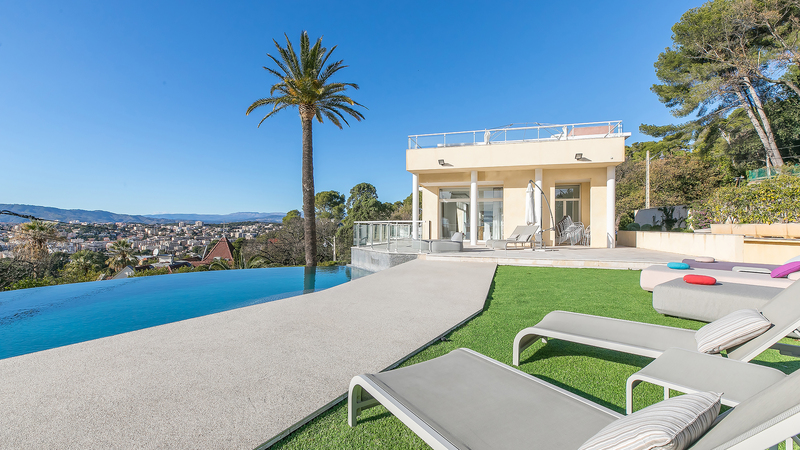 Located in the Oxford area of Cannes and surrounded by greenery, the villa is just minutes away from the incredible array of beaches, boutiques and restaurants on the glittering Croisette. The property is set in beautifully-landscaped grounds and has several outdoor lounge and dining areas to choose from. With a spacious rooftop terrace and fabulous outdoor jacuzzi, this outstanding villa is the ideal choice for an unforgettable summer spent with family and friends on the French Riviera. Stylishly decorated and perfectly situated, this amazing 8-bedroom villa is the perfect holiday residence in the heart of Cannes. Chic and spacious, the interior of the villa is equipped with top quality homeware and accessories and features a wonderful collection of contemporary artwork. A magnificent heated infinity pool overlooks the Mediterranean and the house is surrounded by greenery with panoramic views of the Esterel mountains. With a fabulous roof terrace plus several sundrenched outdoor lounge and dining areas, this incredible property is the ultimate summer residence on the French Riviera. Bright and spacious, the villa’s living area is situated on the main level of the house. Decorated with stylish neutral colours, the living room features a comfortable seating area centred around a large flat screen television and full length windows which open directly onto a large sunny terrace with an outdoor lounge area. The villa has an elegant 12 person dining area with a beautiful wooden dining table. Overlooking the garden and pool area, the dining room will be the perfect space to entertain friends and family during the summer season. Also located on the main floor of the house, the villa has a separate kitchen with an additional dining area. 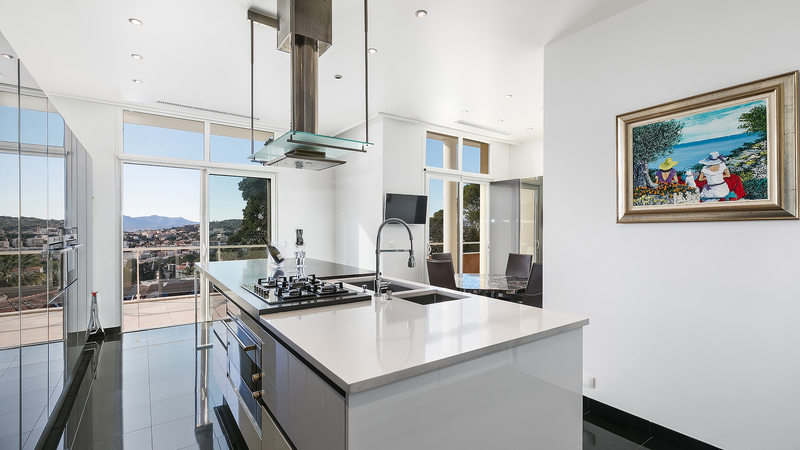 Fully-equipped and finished in contemporary style with stunning mirrored cabinetry, the kitchen features a large central island plus direct access to a large terrace overlooking the city. On the lower floor of the villa you’ll find a large television lounge decorated in chic white with a comfortable seating area for the whole family to relax together. There are 6 double ensuite bedrooms on the main and lower floors of the villa plus a private 2 bedroom apartment at basement level which can be used as staff accommodation during your stay. 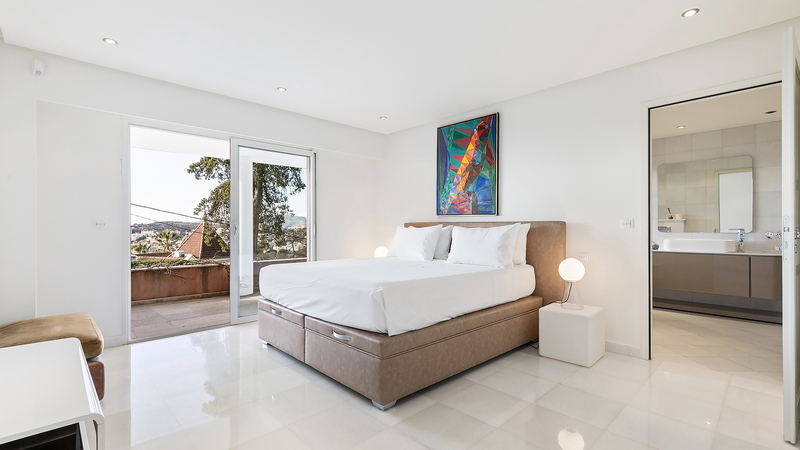 All of the bedrooms have been decorated with a stylish neutral colour palette and feature contemporary artwork from the owner’s private collection. 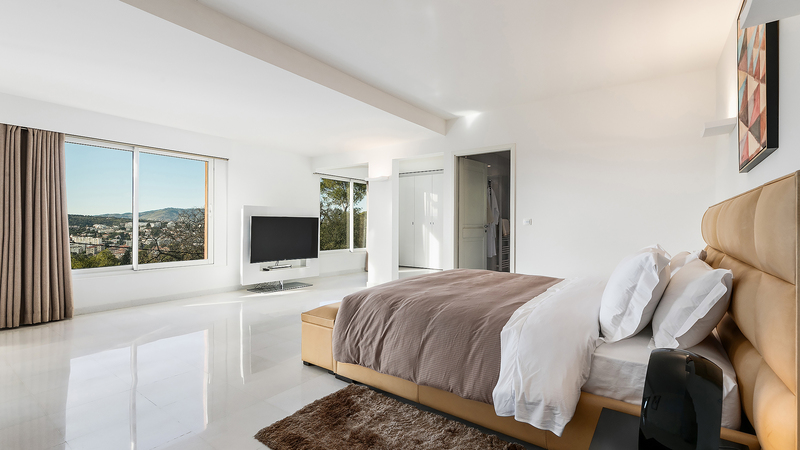 The luxurious master suite can be found on the main floor of the villa and has a large dressing room, beautiful ensuite bathroom and terrace and outdoor lounge area overlooking the Bay of Cannes. 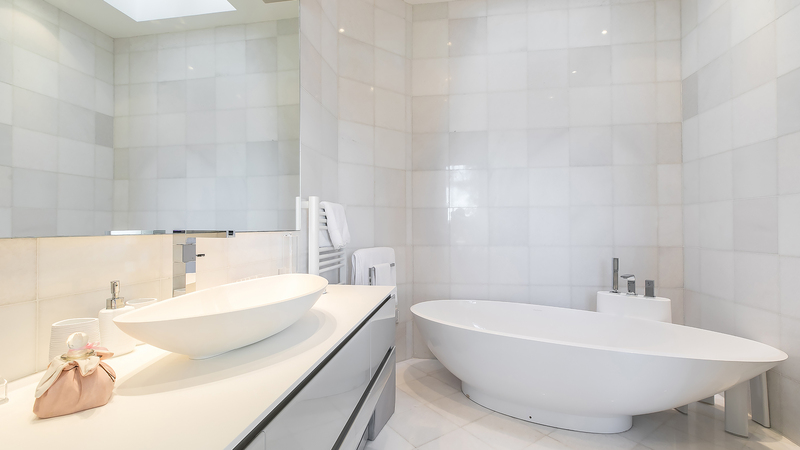 The villa has 6 elegant ensuite bathrooms, all of which have been finished with the very best quality fixtures and fittings. 3 of the bathrooms are equipped with a full bath while the remaining bathrooms feature contemporary walk-in shower units. A guest toilet can also be found on the main floor of the house for visitors. The villa has a fully-equipped laundry room on the basement level. Also on the basement level of the villa is a spacious private apartment with 2 double bedrooms, a shower room, fully-equipped kitchen and lounge area which can be used as staff accommodation during your stay. Surrounded by greenery, the villa is set in a lovely garden planted with a wonderful selection of Mediterranean flowers and trees. The villa has multiple terraces including a spacious rooftop terrace with a dining area, lounge and outdoor jacuzzi. 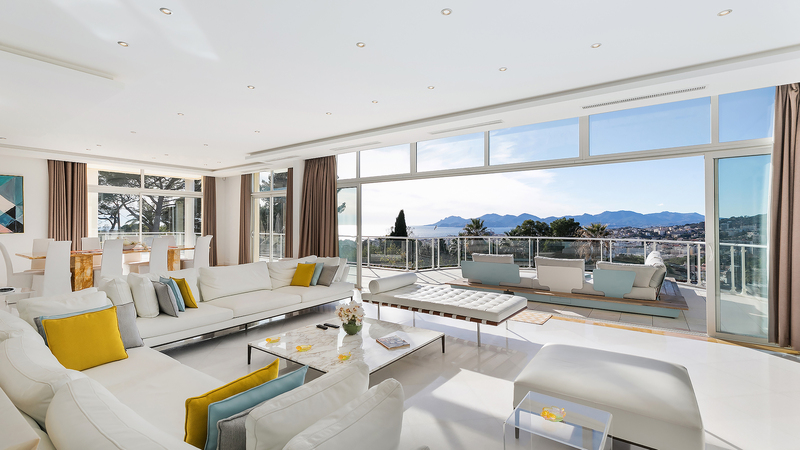 Overlooking the sublime Bay of Cannes, this is the perfect space for entertaining friends during your stay. On the main floor, the living area also opens onto a large wraparound terrace with 2 outdoor lounges, a BBQ area and direct access to the infinity pool. The main floor of the villa opens onto a large sun terrace with a magnificent heated infinity pool. With panoramic views of the city skyline and mountains plus several sunbeds and loungers, the whole family will love spending the summer relaxing poolside. The villa has interior parking for 3 vehicles, plus additional outdoor parking for a further 4 vehicles within the grounds.